POSCO has been taking active part in supporting Free Medical Clinic for Immigrant Workers in Korea since 2007. Together with Raphael Clinic, POSCO is providing Medical Care Volunteer in deprived regions of Nepal and Mongolia once or twice a year. 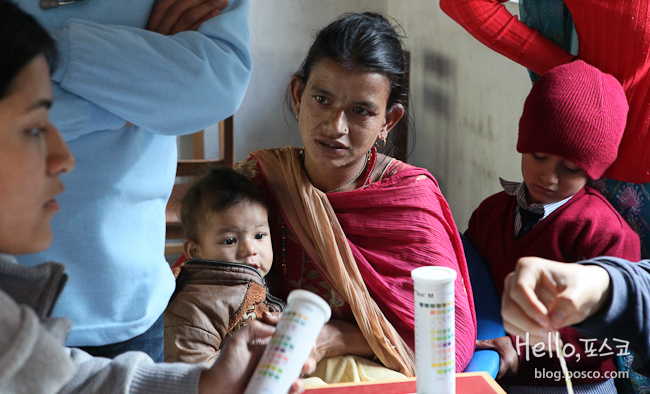 The latest volunteer camp was held at a remote village of Nepal from 23rd to 30th of November. Let’s follow Manager Kwon Jung-Wuk from the Corporate Contribution Group’s journey on the volunteer. We’ve finally boarded ourselves onto the plane for a volunteer trip to Nepal for three nights and four days. It’s a journey to promote and to check for on-the-spot inspection of the POCSO’s social contributive activity in the Nepali area. With a feeling of both anticipation and a bit of worry, we landed in Kathmandu Airport, which reminded us of rather a small-town bus stop at a remote countryside. We’ve arrived at Dhulikhel Hospital, a local cooperation organization in late afternoon. Where we stayed was supposedly a “hotel,” but due to a blackout, most of our activities took place in pitch darkness. What’s more, we had to put on our thick jackets during sleep due to the bitter cold night winds. However, this was just the beginning of our rugged journey. On the first day, we started our volunteer at the village of Solukhumbu with Professor Su-Heon Cho on the residential development of the area such as building chimneys and braziers. Soon we encountered an unpaved road, where our car shook disastrously rough. Furthermore, the end of the unpaved road—which was a single lane—was a cliff, making the situation even riskier when a local bus approached from the opposite direction. 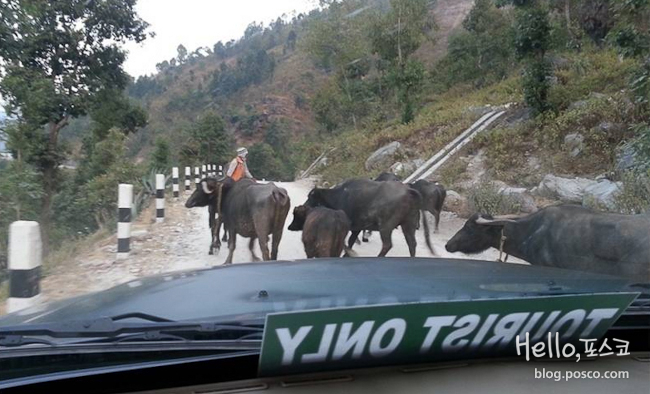 Finally, we were able to arrive at our destination in Solukhumbu village after driving for four additional hours. We realized that it was the absence of exhaust facilities that filters harmful gases like Carbon Monoxide in the environment that use firewood for heating and cooking, which was causing lung problems to the local residents. The need for installing such exhaust facility was urgent. That is why what POSCO decided to support from this year was building chimneys. We’ve also attached a manual board, ‘POSCO Healthy Home,’ for the villagers to be informed. Knowing that the local people’s health may improve due to the chimneys we’ve built made our hearts warm. The next day we traveled 130km to the village of Khimti for a medical volunteer. That’s a distance which takes about seven hours by car. After an endless driving of going up and down the hills several times, we could finally see the Himalayas covered with snow. 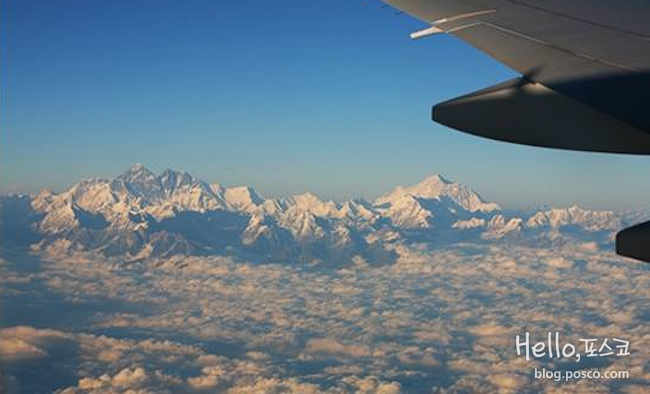 We couldn’t help but to stop for a moment to gape at the sublime scenery of the Himalayas. Also along the way, we had to pause for herd of cows that were occupying the entire road. We had to wait for quite a long time until the herd would move by themselves, due to Hindu belief that regards cows as sacred animals in Nepal. After a troublesome journey, we’ve arrived at Khimti village. The Khimti Outreach Centre, which was being used as a medical camp, was flooding with people who were in line to receive professional treatment. Both the Nepali and Korean medical teams spent a hectic time altogether. While the medical team was busy with seeing the patients, I enjoyed spending time with the local children who came to visit the camp. We had lots of fun talking about the Korean star PSY, who recently became a world sensation and so on. The sound of innocent laughers and smiles of the children seemed to blow my stress away. Namaste, see you soon, Nepal! During four days of running the medical camp, total of 1600 local residents stopped by. The camp pulled off a huge attraction from locals, where some even walked all the way to the camp to receive their first medical treatment of his/her life. I believe that all this was possible thanks to the authenticity of the medical team who put their own expense to the work. If I could, I decided to be part of this again with my own expense in the future. Due to the weak conditions, the volunteer had to end in a tight schedule of only few days. However, the altruistic effort that our medical team has put in and the optimistic demeanors of the local people and the children, even in such deficient conditions, made the departing warm and meaningful. I offered a quiet goodbye gazing at the Himalayas behind me on the plane.